The Washington Redskins were rolling along at 11-0 as they hosted their rivals, the Dallas Cowboys, on November 24, 1991. In their eleventh year under Head Coach Joe Gibbs, they had been as dominating as the record indicated, putting plenty of points on the board (including a total of 97 in the previous two games) while the defense had recorded three shutouts and not allowed an opponent to score more than 17 points in the last seven contests. The visiting Cowboys were a team on the rise under Head Coach Jimmy Johnson. But while they had gotten off to a 5-2 start, they had lost three of their previous four games and were at 6-5 coming into Washington. Furthermore, the defense was ranked 25th. Still, QB Troy Aikman was improving in offensive coordinator Norv Turner’s system and RB Emmitt Smith and WR Michael Irvin were also emerging as stars. There were 55,561 fans in attendance at RFK Stadium. They saw the Redskins take a 7-0 lead in the first quarter when, with just under five minutes remaining in the period, CB Martin Mayhew intercepted an Aikman pass and returned it 31 yards for a touchdown. The Cowboys evened the score in the second quarter when, facing a third-and-15 situation, Emmitt Smith scored on a draw play from 32 yards out. At the end of the first half, Aikman threw a “Hail Mary” bomb that WR Alvin Harper pulled away from CB A.J. Johnson for a 34-yard touchdown. Coach Jimmy Johnson had gone for the fourth down conversion for the third time rather than use PK Ken Willis, who tended to be more dependable kicking on an artificial surface than grass. In any case, it had worked out with Dallas holding a 14-7 halftime lead. The Cowboys had done a fine job of keeping the ball away from Washington’s offense in the first half and limited the Redskins to just 16 rushing yards. It looked like trouble for Dallas, however, when Aikman left the game early in the third quarter with a sprained right knee. In to replace him was QB Steve Beuerlein (pictured at top). The 26-year-old Beuerlein had played three years with the Raiders after coming out of Notre Dame before moving on to Dallas just before the ’91 season to back up Aikman. A classic dropback passer with limited mobility, he also had strong leadership skills. The Cowboys came up empty following Beuerlein’s entry into the game when Willis missed a field goal attempt. On their next drive, Beuerlein completed two throws to WR Michael Irvin but Dallas didn’t hit paydirt until the following possession as Irvin caught two more passes, including a one-handed grab for a 24-yard TD on the third play of the fourth quarter. In response, the Redskins shifted to a no-huddle offense and drove 92 yards in 13 plays. RB Gerald Riggs ran the final yard for a touchdown and the Dallas lead was cut to 21-14 with 8:21 remaining to play. Dallas then ran some seven minutes off the clock in a 15-play series that ended with Willis kicking a 42-yard field goal for a 24-14 lead with 1:14 left in the game. In the closing seconds, Rypien passed to Sanders for a 29-yard touchdown to narrow the margin. But the Cowboys recovered the ensuing onside kick and that was it. Dallas came away with a 24-21 win. The Cowboys led in total yards (399 to 262) and first downs (23 to 15) and also held onto the ball for almost 39 minutes. The Redskins, for their part, recorded five sacks. Each team turned the ball over one time. Troy Aikman was successful on 13 of his 20 passes for 204 yards with a touchdown and an interception before giving way to Steve Beuerlein, who completed 7 of 12 throws for 109 yards and a TD. 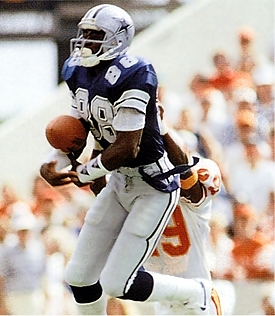 Michael Irvin (pictured below) had an outstanding performance and consistently outmaneuvered CB Darrell Green, catching 9 passes for 130 yards and a touchdown. Alvin Harper added 101 yards on his four receptions that also included a score. Emmitt Smith rushed for 132 yards and a TD on 32 carries. For the Redskins, Mark Rypien went to the air 33 times and completed 17 for 212 yards with a touchdown and one intercepted. WR Gary Clark caught 7 passes for 82 yards. The miniscule running attack was led by RB Ricky Ervins and his 29 yards on five attempts while RB Earnest Byner carried 8 times for 22 yards. 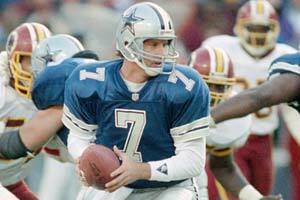 While the injury to Troy Aikman knocked him out for the remainder of the regular season, the Cowboys won their remaining games with Beuerlein at quarterback to finish with an 11-5 record for second place in the NFC East and a Wild Card spot in the playoffs. Dallas defeated the Bears in the first round before losing to Detroit at the Divisional level. The Redskins came back to win three straight before losing the season finale and ending up with a 14-2 record atop the NFC East. They went on to win Super Bowl XXVI over the Buffalo Bills. Steve Beuerlein completed 68 of 137 passes (49.6 %) for 909 yards with five touchdowns and two interceptions and despite his lack of mobility was sacked just six times. He also led the Cowboys to their Wild Card playoff win. Beuerlein backed up Aikman again in 1992 before moving on to the Cardinals. Michael Irvin caught 93 passes for a league-leading 1523 yards (16.4 avg.) and eight touchdowns. He was a consensus first-team All-NFL selection and was named to the Pro Bowl for the first of five consecutive years. Emmitt Smith led the NFL in rushing with 1563 yards on 365 carries (4.3 avg.) and 12 touchdowns (he added another TD as a receiver). He also was named to the Pro Bowl, for the second of six straight seasons and eight overall.